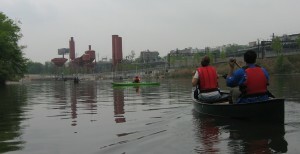 Announcing SWINY Canoe Trip on the Bronx River!! New York is one of the greatest port cities in the world. You’d never know it, though, for the amount of time New Yorkers spend thinking about (or actually on) the water that surrounds us. That’s about to change as SWINY takes to the Bronx River in a special, all-water edition of our summer social. The trip will be an easy one–a leisurely evening paddle on the estuary of the Bronx River in Hunts Point. But since we’re science writers, it wouldn’t be a SWINY trip without *some* science, now would it? Sign up for the trip and you’ll learn about the water in and around New York that makes this city a surprising and magical place. We’ll be led by the able staff of the Bronx River Alliance, a public-private non-profit dedicated to protecting and restoring the Bronx River watershed. Victoria Ruzicka from NYC Parks Natural Resources Group will tell us about efforts to restore a portion of the city’s once-legendary oyster populations. Paul Mankiewicz, founder and director of the Gaia Institute will accompany us on the trip to tell us about what happens to stormwater when it rains and about new green infrastructure projects in the Bronx. Time: 5:00 to 8:00 p.m.
To sign up, click the link below. If the trip is full, you’ll be able to sign up for a waiting list.